When it is time to replace the brake pads on your vehicle the options can be overwhelming. Provide excellent transfer of heat away from the rotor (this helps prevent against warping of the rotor, which can occur when the rotor is overheated). Semi-metallic brake pads are hard and wear down slowly. They generate more dust that can stick the wheels. semi-metallic pads can wear down the surface of the rotor more quickly making it harder to resurface them. 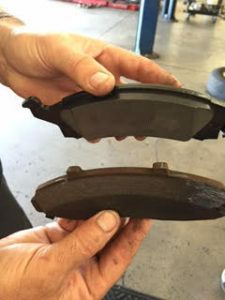 Ceramic brake pads are softer and so put less wear on the rotor’s surface. Quieter and are good at producing smooth friction for consistent stopping. Easier on the surface of the rotors allowing you to get more life out of your rotors. Ideal for small and compact cars. Not ideal for heavy vehicles or towing packages. 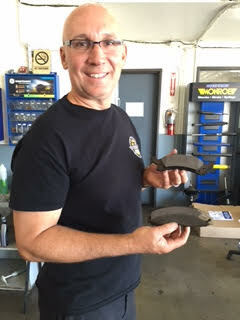 Being a Napa Service Center we usually go with Napa brand brake pads. Here is a little bit on our favorites. NAPA’s brake pad lineup includes four grades: Proformer, Premium, Ultra Premium and Adaptive One. All of the brake pads NAPA sells meet the original manufacturer’s (OM) specifications for performance, and all stop smoothly and quietly. Proformer Ceramic brake pads are available for many older model vehicles and some late model cars and light trucks. These pads offer dependable performance and quality-tested formulas to ensure safety and reliability. If Proformer brake pads are available for your vehicle, choose them for a good brake job at a good price. Premium Ceramic brake pads are a step up from Proformer pads and the ones RAD Auto repair usually recommends, with special formulations designed for quiet operation. Premium pads undergo the most rigorous testing and outperform competitors in overall performance. Choose NAPA Premium brake pads if you require better performance from your brakes.